Our latest climate summary looks back at a memorable January that saw an extended stretch of cold weather, two major snow events, and some drought recovery late in the month. The Arctic chill that settled in for much of the past month resulted in our coldest January in the past 30 years. The statewide average temperature of 34.56°F ranked as our 11th-coolest January on record dating back to 1895, and the coldest since 1988. We were a full five degrees cooler than the 1981 to 2010 average, and nearly 10 degrees cooler than last January, which saw cold weather early in the month give way to warmer weather. Interestingly, last January actually saw the colder overall temperatures. After a snow event on January 6-7, 2017, the temperature in Waynesville dropped to -11.0°F. Last month, the lowest temperature observed in the state during January was -8.7°F at Mount Jefferson on January 6. However, this year's early January cold snap was much longer-lasting. Sites all across the state set new records for the longest streak of hourly temperatures at or below freezing, and over a nearly 15-day period from December 24 through January 8, all or part of our ECONet was below freezing. 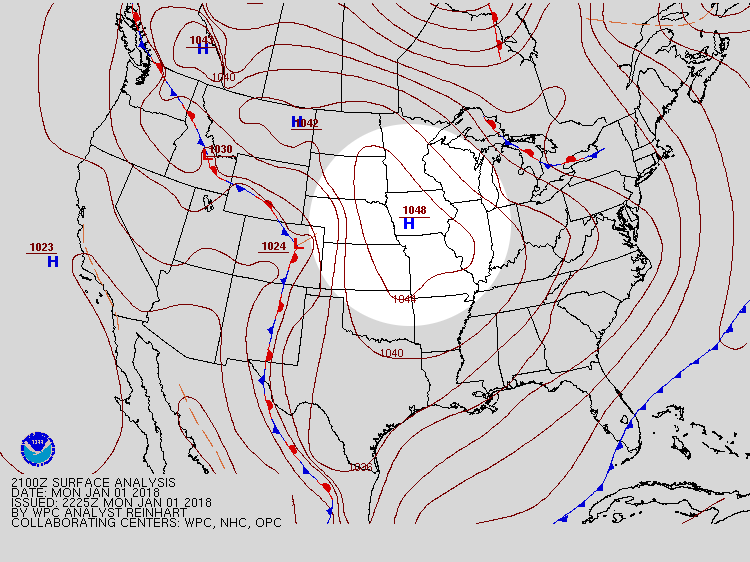 That frigid air was delivered by a series of high pressure systems with Canadian origins that set up to our west. Even after that feed of Arctic air shut off in the second week of the month, regular frontal passages throughout the rest of the month kept our temperatures largely at or below normal. All across the state, a number of stations reported one of their top ten coldest Januarys on record. It was tied for the 7th-coldest January in Elizabeth City since 1934, tied for the 5th-coldest in Waynesville out of 114 years with data, and the 5th-coldest in Statesville dating back to 1901. While our cold start to the month continued a stretch of dry weather that began early last fall, the temperature moderation from those frontal passages also brought some needed precipitation, and the month finished on the wet side of normal. With an average statewide precipitation of 4.09 inches -- a tenth of an inch more than the 1981 to 2010 average -- we had our 47th-wettest January out of the past 124 years. 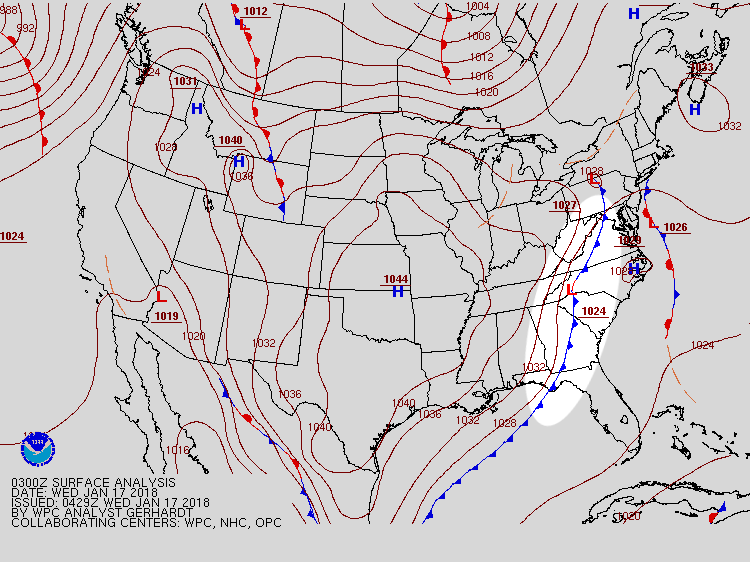 Precipitation fell in a variety of forms, beginning with a significant snowstorm for the Sandhills and Coastal Plain on January 3-4. On January 17, another snowstorm hit the Piedmont, bringing some of the greatest accumulations in nearly four years, and dropped up to 10 inches across parts of the Outer Banks. Rainfall from frontal passages on January 23 and 28 provided more than 2 inches of additional liquid precipitation, with total monthly precipitation of more than 4 inches across parts of the eastern Piedmont and more than 6 inches across the southeastern Mountains and immediate coast. Long-term records from Wilmington, which received 6.66 inches of precipitation last month, indicate it was the 9th-wettest January there out of the past 144 years. It wasn't a wet month everywhere, though. The far western Mountains along the Tennessee border didn't see the rain or snow that fell across the rest of the state. Notably, Murphy received just 1.76 inches of precipitation all month -- their 3rd-driest January there in the past 48 years. That resulted in Moderate Drought being introduced in parts of Cherokee County midway through the month. With that one drought addition in western North Carolina aside, for much of January, the state's depiction on the US Drought Monitor went largely unchanged, which may suggest it was an easy month for the NC Drought Management Advisory Council. Behind the scenes, though, each week brought plenty of discussion about measuring wintertime drought severity and weighing longer-term dryness against more recent wetness. 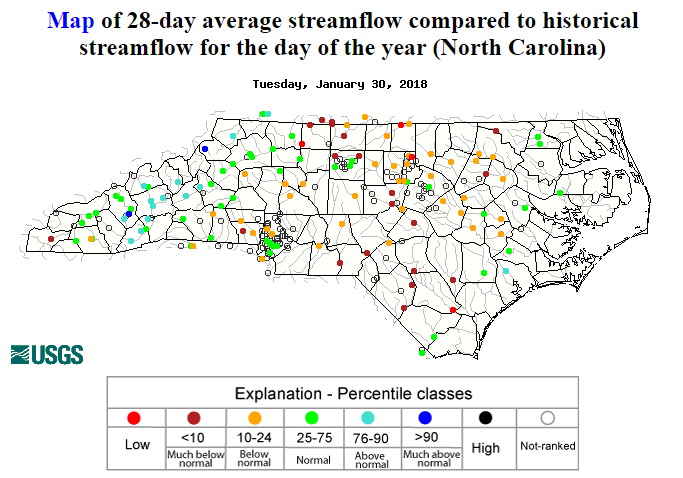 During the dry beginning of the month, parts of the central and northern Piedmont were on the verge of being classified in Severe Drought due to declining streamflows and reservoir levels. 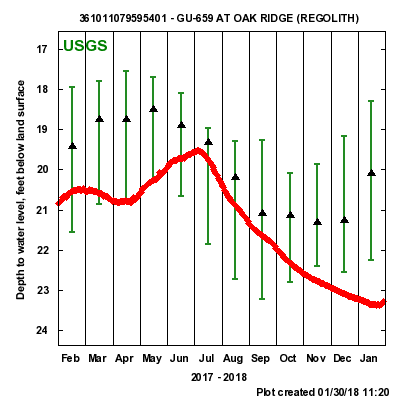 However, the precipitation events later in the month provided some relief to surface conditions -- including that muddy ground you had to avoid after the snow melted. As a result, the latest US Drought Monitor map includes widespread improvements in North Carolina. Most of the Coastal Plain, as well as the southeastern Mountains near Asheville, are now completely out of Abnormally Dry conditions. The northeastern Piedmont including the Triangle was the first spot where Moderate Drought emerged last October, but the recent precipitation totaling more than three inches over a two-week period was enough to drop them back into Abnormally Dry conditions. US Drought Monitor maps for North Carolina on January 2 (left) and January 30 (right). Just because we've seen some improvements, it doesn't mean we're out of drought's woods just yet. Surface conditions have improved and have even been a bit soggy, but the sub-surface is still dry. Volumetric soil moisture as assessed by NASA SPoRT over North Carolina. Soil moisture at a depth of 40 to 100 centimeters (15 to 40 inches) remains a bit low across the Piedmont and western Coastal Plain, and longer-term streamflows are still below normal, especially in the northwestern Piedmont, far southwestern Mountains, and southern Coastal Plain, which all missed out on some of last month's heavier precipitation. 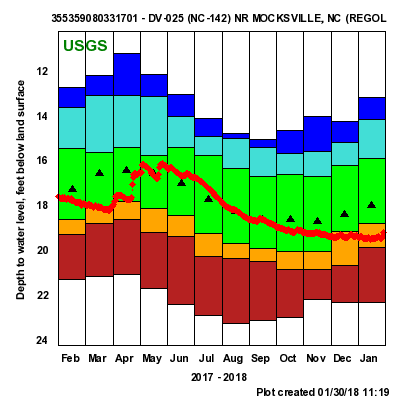 Groundwater levels in the western Piedmont, where Moderate Drought remains, also remain below normal, although one promising sign was a slight uptick in levels in response to recent rains. It's the first improvement that those deeper wells have seen since early last summer. 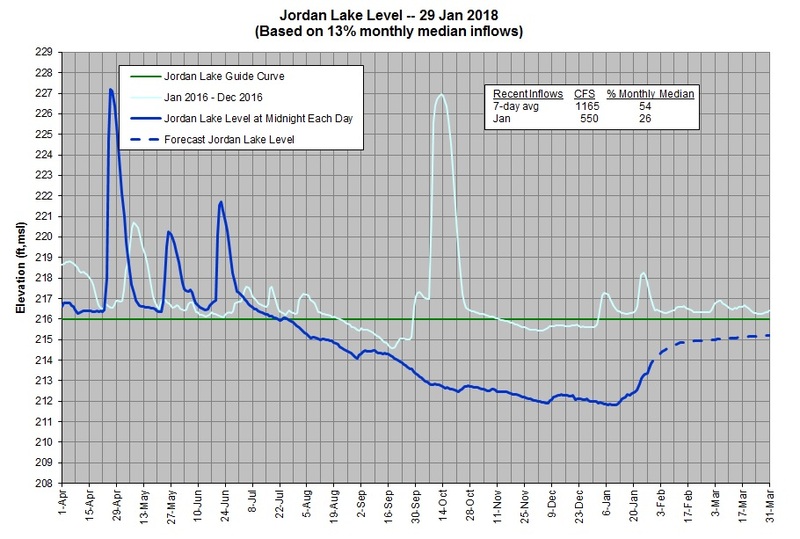 Reservoirs are in better shape after the recent rains, especially since sites downstream of Falls Lake and Jordan Lake received some of the heaviest precipitation, which allowed the US Army Corps of Engineers to limit their releases from the lakes. 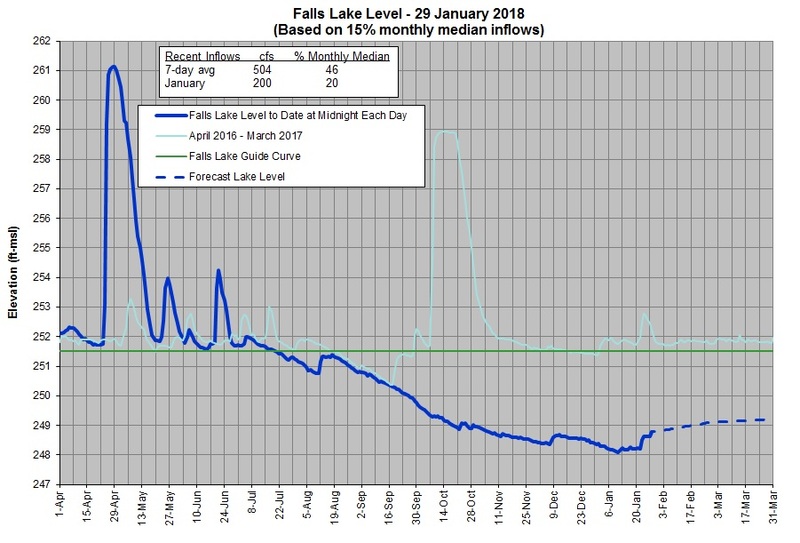 The cooler weather has also curbed water losses due to evaporation, but Falls Lake is still about two feet below its target. Even though January defied our expectations of how a La Niña winter should look in North Carolina, the outlook for February hints at the return of a drier, more La Niña-like pattern to return across the southeast US. With all that in mind, we're certainly in better shape now than we were one month ago, but we can't say goodbye to drought just yet.